When we're looking for our favorite show each week we take into consideration all aspects of a performance. Arrangements, drill, entertainment value, execution, musicality, and more. This weekend we were overwhelmed with fantastic halftime shows especially considering it was only the first performance for the majority of bands across the country and typically those performances aren't their best. It is clear that all bands are stepping up their game in 2017 and that has us giddy with excitement. This week there was one show that we kept coming back to over and over again. The North Carolina A&T University Blue Gold Marching Machine took the field at Gardner-Webb University and absolutely took over. The performance included a medley of Bruno Mars hits and it is straight FIRE! The arrangements are fantastic and the energy they bring to the field is contagious. One thing we noticed with this performance was the balance they showed musically across the band. Their blend during multiple parts of the show was fantastic. It's always awesome to watch an HBCU band not only blow your face off, but also wow you with their dynamics and musicality. That's why we've chosen this performance as our favorite of the week and we think you'll love it too! 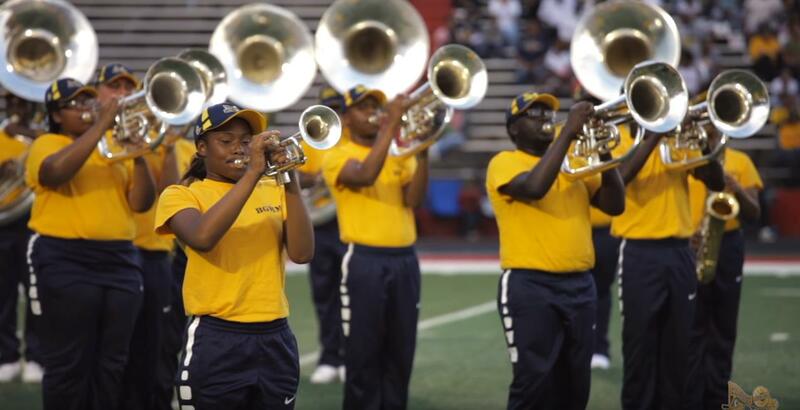 Share and enjoy this great performance by the Blue Gold Marching Machine.